Ballymena Mart was the venue for the NI Simmental Cattle Breeders’ Club’s evening show and sale of pedigree and commercial livestock. 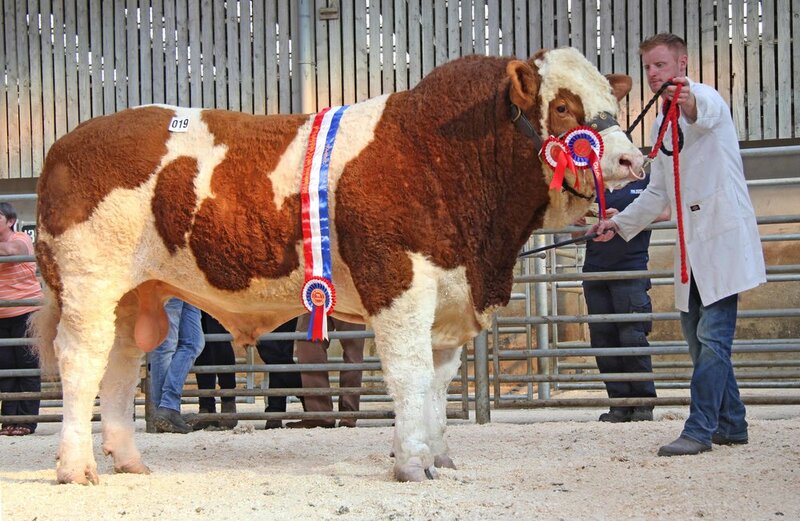 Bulls reached a ceiling of 3,100gns, while pedigree females sold to a top of 2,200gns. In the commercial section cows with calf at foot peaked at £1,300 twice, and maiden heifers sold to a top of £1,200 twice. 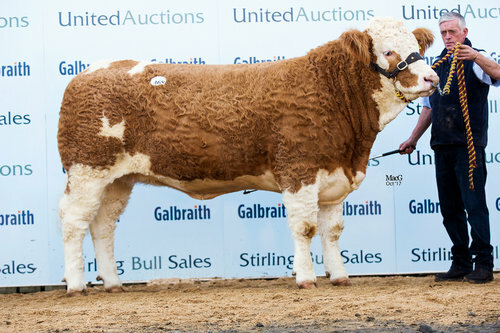 Topping bull trade at 3,100gns was the reserve male and reserve supreme champion Drumlone Inmate TSI +77 SRI+89 bred and exhibited by Kenneth Veitch, Lisbellaw. This fifteen-month-old Carnkern Titan son was bred from the Raceview King daughter Corbally A1 Kate, and is a full brother to Drumlone Fabulous, sold at Stirling in February 2016 for 10,000gns. 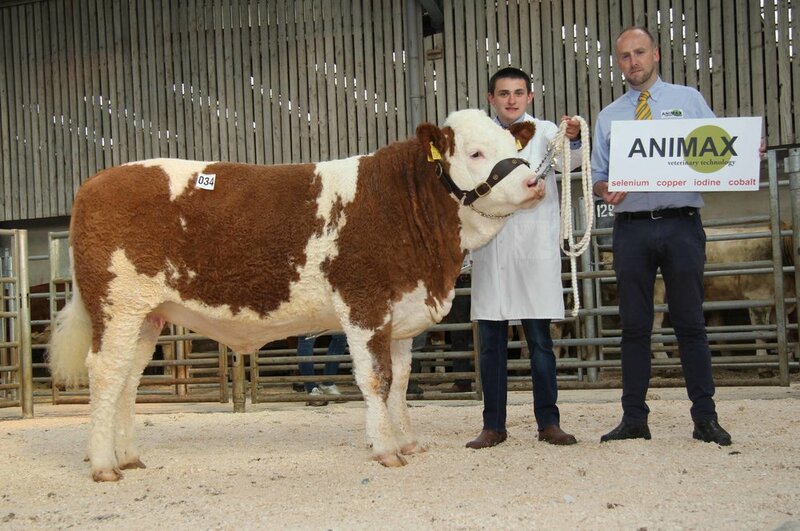 Buyer was pedigree breeder Kenneth Stubbs from the Drumbulcan Herd in Irvinestown. 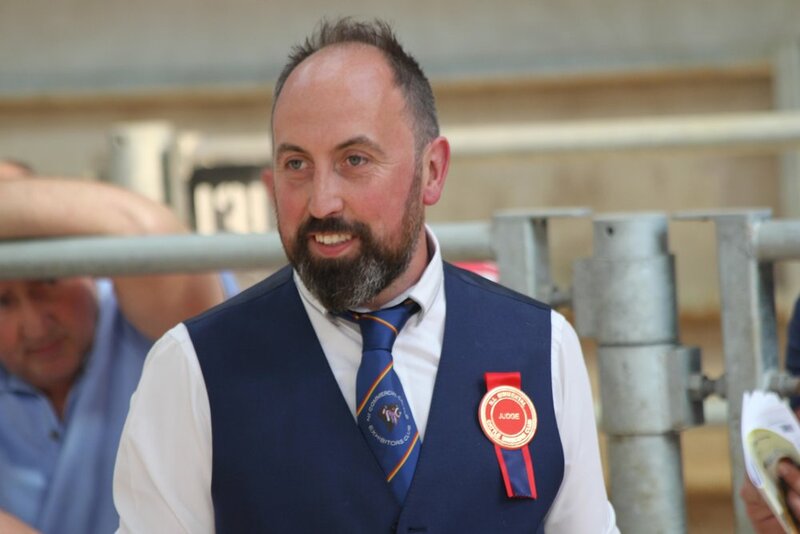 Kenneth Veitch, Lisbellaw, exhibited the reserve male and reserve supreme champion Drumlone Inmate sold for a top price of 3,100gns at the NI Simmental Club's evening show and sale in Ballymena. Judge James Alexander from Randalstown awarded the male and supreme overall championship ribbons to the February 2017 Shacon Invincible TSI+91 SRI+91. Bred by Brian Dooher, Donemana, he was sired by Kilbride Farm Delboy, and is out of the Anatrim Bodybuilder daughter Celtic Eve – one of six cows in the herd, founded in 2011. In the breed’s top 5% for eye muscle area +5.5, he sold for 2,200gns to Eric Connor from Maghera. Male and supreme overall Simmental champion was Shacon Invincible bred by Brian Dooher, Donemana, and exhibited by Ritchie Devine. James Alexander from Randalstown judged the NI Simmental Club's evening show and sale in Ballymena Mart. Four lots came under the hammer at 2,000gns each. First to go was the February 2017 Cladymore Invincible TSI+50 SRI+56 from Archie Reaney’s herd in Markethill. This third prize winner was sired by Hillcrest Valentine, and is bred from the Omorga Murray daughter Ballinlare Farm Favourite Lady. Buyers were H and S Griffin, Portglenone. Kilbride Farm Warren was behind the breeding of the February 2017 Cleenagh Ivory TSI+91 SRI+108 bred by Adrian Richardson, Maguiresbridge. This fifth prize winner was bred from Cleenagh Eyeful – a daughter of the 12,000gns Stirling champion Drumlone Anchor. Next best at 2,000gns was the first prize winning Hiltonstown Ike ET TSI+80 SRI+94 bred by Richard Rodgers, Portglenone. Born in March 2017, he is by the 2014 and 2015 Balmoral Show breed champion Dermotstown Delboy, and is out of a home-bred dam by Woodhall Premier. Also selling at 2,000gns was the fourth placed Kilbride Farm Idris TSI+56 SRI+43 from the Robson family at Doagh. Sired by stock bull Corskie Damario, he is out of the Cairnview Snazzy daughter Kilbride Farm Fanni 40E – full sister to the 12,000gns Kilbride Farm Bantry. Pedigree females peaked at 2,200gns, paid to Leslie and Christopher Weatherup, Ballyclare, who offered an unled draft from their 35-cow Lisglass Herd. Leading the offering was the October 2016 Lisglass Hope, a daughter of herd sire Dermotstown Delboy. She is out of a home-bred Woodhall Premier dam. The female champion Castlemount Angela 2nd came under the hammer at 1,850gns for Duncan McDowell from Newtownards. This thirteen-month-old heifer was sired by Kilbride Farm Bantry, and is out of a Slievenagh-bred dam from the 12,000gns Dovefields Gallant. Richard McKeown exhibited the female champion Castlemount Angela 2nd on behalf of Duncan McDowell, Newtownards. Addiing his congratulations is Neill Acheson, Animax, sponsor. Mr McDowell also realised 1,800gns for the seven-year-old cow Drumagarner Cute. Sired by Barnattin Wally, she is out of a dam by Lisglass Python. Included in the price was her March born Kilbride Farm Escalop bull calf Castlemount Jetliner. In the commercial section, cow and calf outfits sold to £1,300 twice, and £1,200 twice, paid to Frank Cunning from Glarryford. Maiden heifers peaked at £1,200, paid to Nigel Glasgow and Malcolm Thom, both from Cookstown. Other leading prices include £1,180 and £1,100 twice. The NI Simmental Club is indebted to its sponsors, Animax and Connon General Merchants, for their generous continued support. NI Simmental Cattle Breeders' Club chairman Conrad Fegan, centre, is pictured with sponsors of the evening show and salein Ballymena, John Connon, Connon General Merchants; and Neill Acheson, Animax. Bull, born between 15/09/16 and 22/12/16 – 1, Ian Davidson, Stewartstown Harry by Dripsey Super King; 2, Robin Boyd, Slievenagh Harvester by Kilbride Farm Delboy; 3, Kenneth Stubbs, Drumbulcan Heartbeat by Drumacritten Callum. Bull, born between 02/01/17 and 22/01/17 – 1, Kenneth Stubbs, Drumbulcan Ivor by Drumacritten Callum; 2, Andrew Clarke, Breaghey Ironman by Breaghey Diamond; 3, Joe Campbell, Camus Icon by Curaheen Apostle. Bull, born between 05/02/17 and 20/02/17 – 1, male and supreme champion, Brian Dooher, Shacon Invincible by Kilbride Farm Delboy; 2, reserve male and reserve supreme champion, Kenneth Veitch, Drumlone Inmate by Carnkern Titan; 3, Archie Reaney and Sons, Cladymore Invincible by Hillcrest Valentine. Bull, born between 04/03/17 and 20/04/17 – 1, Richard Rodgers, Hiltonstown Ike by Dermotstown Delboy; 2, Adrian Richardson, Cleenagh Idle by Kilbride Farm Warren; 3, Leslie and Christopher Weatherup, Lisglass Icon by Dermotstown Delboy. Reserve female champion was Jason Whitcroft's Whitdrum Lady Delilah. Included is sponsor Neill Acheson, Animax.